The Disney Cruise Line announced today that they will begin sailing out of Miami, Florida, starting in December of 2012. The company, who announced an expansion of cruises on the West Coast (and elsewhere) back in April of last year, is bringing one of their ships back to Florida. The Disney Wonder, capable of sailing with up to 2400 passengers on board, was sent from Cape Canaveral to Los Angeles just last year. Now it will be returning back to Florida and will be based out of Miami. This will be the first ship that Disney Cruise Line has sailing out of Miami, its other Florida cruise ships are based out of Cape Canaveral. Part of the reason for the change appears to be related to the amount of violence being reported in Mexico. Disney and other cruise lines have had to eliminate certain routes to previously visited destinations in Mexico, due to the concern of violence. The Disney Wonder’s first cruise out Miami is scheduled for December 23, with a trip to the Caribbean. 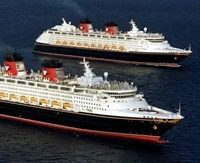 Disney also announced today that in 2013, the Disney Magic will be stationed in Barcelona, Spain, and will sail on 12 night cruises to Venice Italy and Croatia’s Dalmatian Coast on one itinerary. Another itinerary will cruise to Ephesus, Turkey and Athens, Greece. Other itineraries and destinations will also be available.